Vincent Villafranca, and replaces the bust of Lovecraft trophy designed by Gahan Wilson. As the competition was still in progress during the WFC in Columbus, OH, the 2016 winners were presented with certificates; they will receive their statuettes later this year, from the chairman of the 2016 World Fantasy Convention, as soon as they have been cast.There is no financial remuneration for the winner, as the Awards Administration and the Board of the World Fantasy Convention are not fund-holding entities; each convention is run by a discrete group of people and is self-funding, so this was not a commercial opportunity for the winning artist. However, Vincent Villafranca will receive two life memberships to the World Fantasy Convention as a small token of our thanks.Further, semi-finalist Misty Hawkins will receive two memberships to the 2017 World Fantasy Convention in San Antonio, Texas.The Board of the World Fantasy Convention and the Awards Administration would like to thank world-famous artist Gahan Wilson, who sculpted the original WFA Statuette. The bust of H.P. Lovecraft, which was in use for more than four decades, was donated in perpetuity and will continue to live on in the shape of the nominee pins given out to all those shortlisted for a World Fantasy Award. 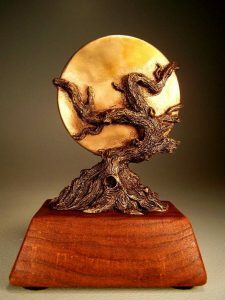 In a note on the design, the Awards Administration stated that they “wanted something representational that would reflect the depth and breadth of the fantasy field, from horror to high fantasy and all stops in between.”For more information about the World Fantasy organization, see their official website. The 2017 World Fantasy Convention will be held November 2-5, 2017 at the Wyndham Riverwalk in San Antonio TX.